La Casona de Rio Fortuna. The dream of a simple life. Simple but, absolutely fulfilling. La Casona de Rio Fortuna is not only a beautiful and large home but, it’s also rich in history. 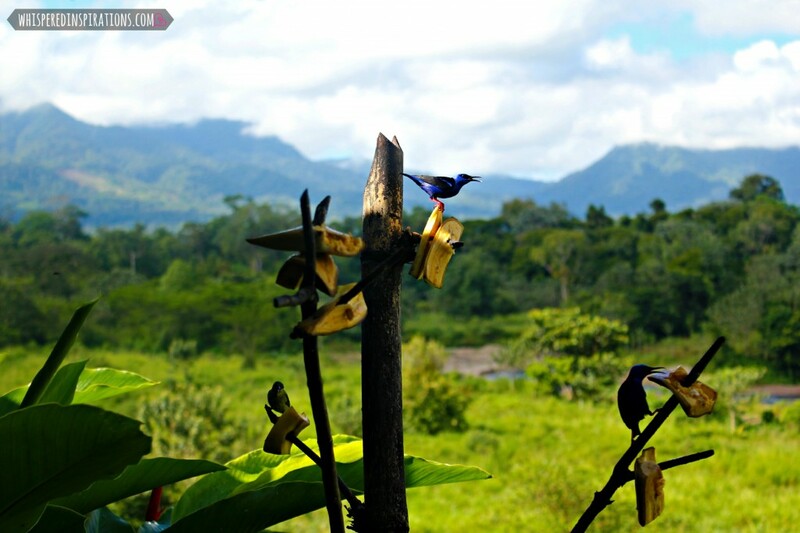 We travelled to the San Carlos area from Hotel Arenal in La Fortuna for a half-day excursion to this plantation. We were greeted by Eli, the owner of La Casona de Rio Fortuna and he explained to us how they live on the property and that it had once been home to an Ex-President of Costa Rica. The Casona Rio Fortuna, old farmhouse and former president Rafael worthy Iglesias, is a space that provides the warmth that distinguishes tico in a familiar and very homely atmosphere. Ask a class of typical kitchen wood stove, a webbed tortillas, take freshly brewed coffee, sugarcane juice at the foot of Grandfather mill centenary of oxen, riding on a tractor touring the beautiful peasant plantations of fruits and vegetables, visit the school place and dance with typical children, ending with a beautiful guitar serenade Costa Rican music or stay in comfortable, rustic rooms with Fortuna river lullaby, the song of birds and the multiple Arenal volcano, are part of countless experiences that Cultour provides. We were surprised with a homemade shot of moonshine and we began our tour of the home. Don Milton introduced us to his wife, Doña Eli. We also met their adorable family dog, Paco. We were very jealous of the life that little dog leads, a good old country life with no worries. We jumped right in and we hand-made some tortillas. 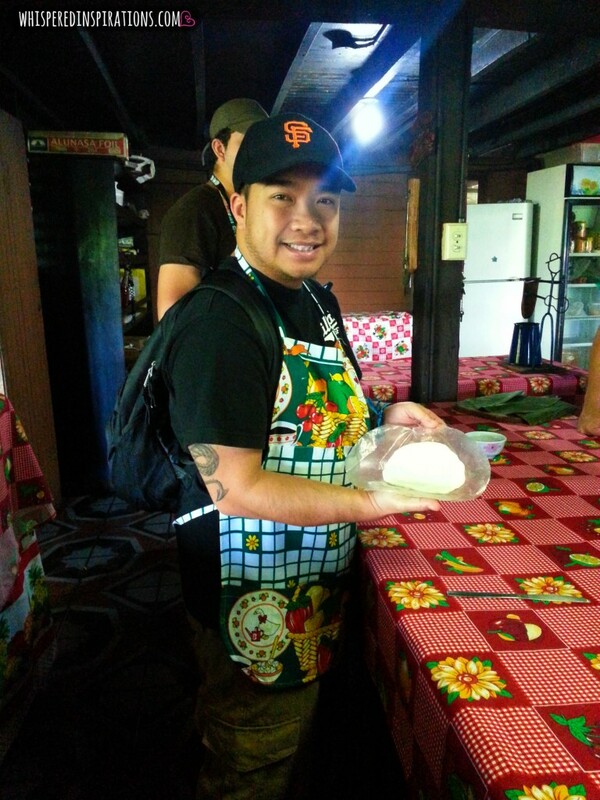 It was the first time for Dara and both him and our guide, Mario, made excellent tortillas. They put me to shame. We put our names on them and the staff put them on the wooden stove. The staff took them when they were ready and Doña Eli topped it off with a delicious, spicy papaya salsa called Picadillo. Dara absolutely fell in love and I am a picky eater and I loved it. 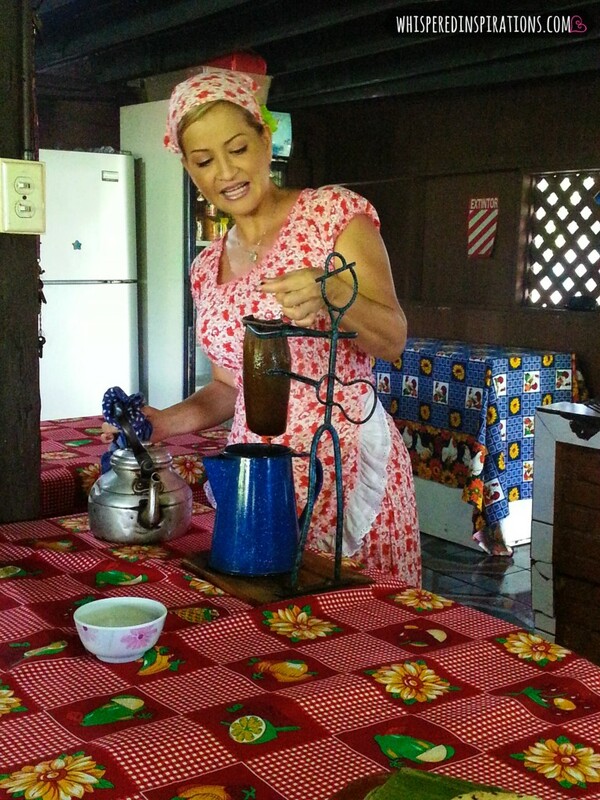 Doña Eli showed us how to make cafe apagado, which is the traditional Costa Rican way to make coffee. It was strong and incredibly delicious. The way you make it is that you essentially boil the coffee on the wooden stove and then strain it in the contraption pictured above so that the end result is an amazing cup of joe. 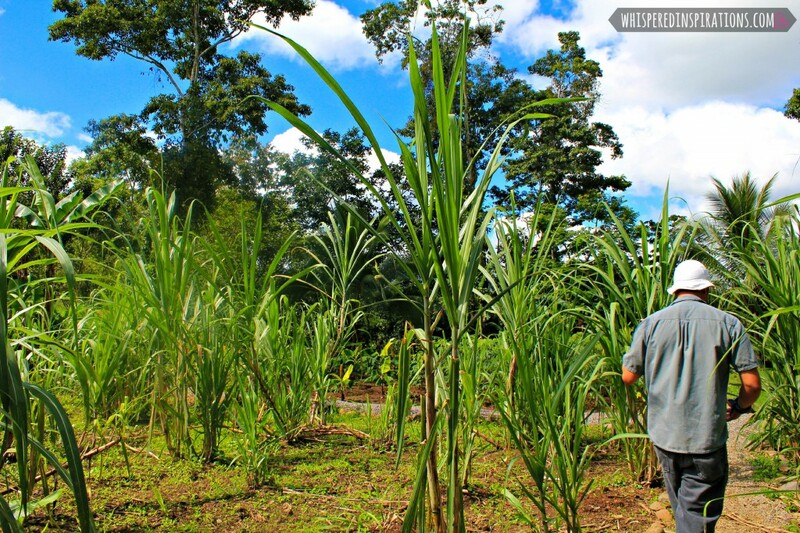 Don Milton then began his tour of the grounds and he taught us about sugar canes, plantains and yuca. He also has many natural herbs on-site and trees. Ever heard of Ylang Ylang? Don Milton showed us the tree and he picked off a flower and it smelled delightful. The tour was very educational and I was blown away about the work it takes to keep a farm. Tico Life Is Pretty Sweet. Next stop was an educational tour about making sugar. Either pure sugar cane juice or sugar cane candy. 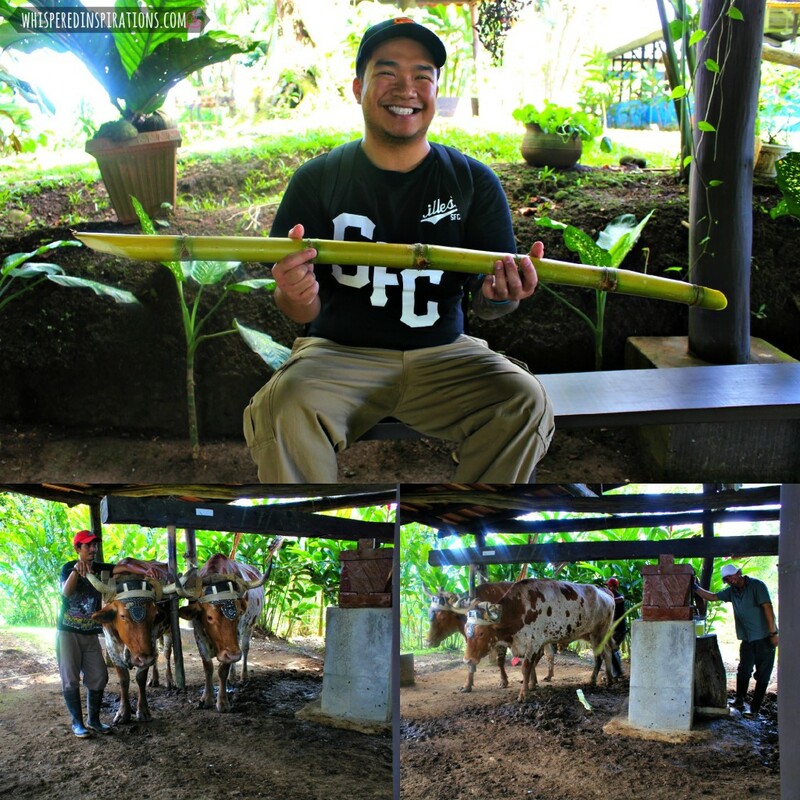 We had a taste of both and we even chewed on a piece of raw sugar cane and boy was it sweet. The juice we sampled was squeezed by ox-power and that is definitely not something you can say everyone’s done. What an experience! The sugar candy melts right in your mouth and it was nostalgic, I am certain I have tasted it in my childhood. I definitely took some home to savor for a long time to come. We then hopped into our tour van and drove to the Escuela of Sonafluca. As soon as we stepped out the group of kids greeted us with big smiles and welcomes of hello. They took us by the hand and led us through their school and told us to take a seat, they put on a presentation for us. They performed a few dance routines and then the last dance they came over and took us by the hand and we played a game that resembled musical chairs but, it was sans le chairs. Afterwards we took part in a Q&A with the kids and they asked questions and we asked them a few ourselves. We discovered that life for them is pretty typical of a child, it’s simple but, they still enjoy futbol and watching the tube. It was one of the highlights of the tour for us. 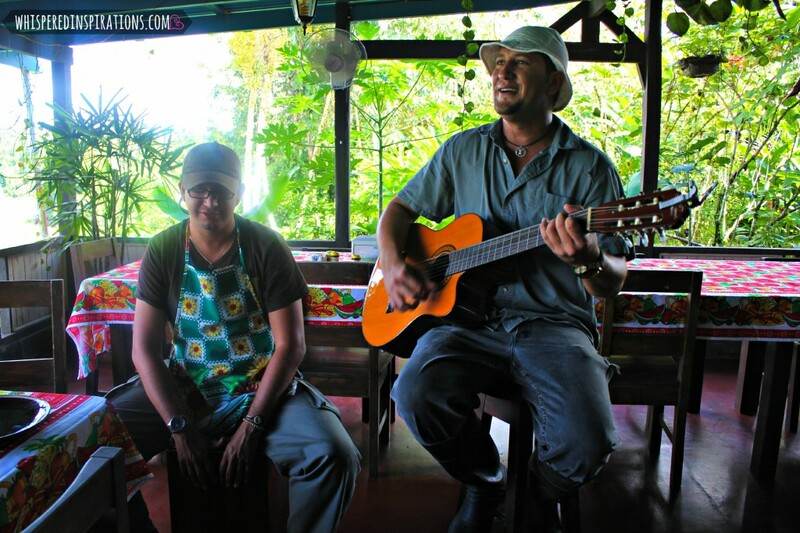 Don Milton and Doña Eli took out their instruments and began to sing traditional Tico songs. They both have beautiful voices and play beautifully. The food was delicious and we ended it with coffee, dessert and a shot of liquor. 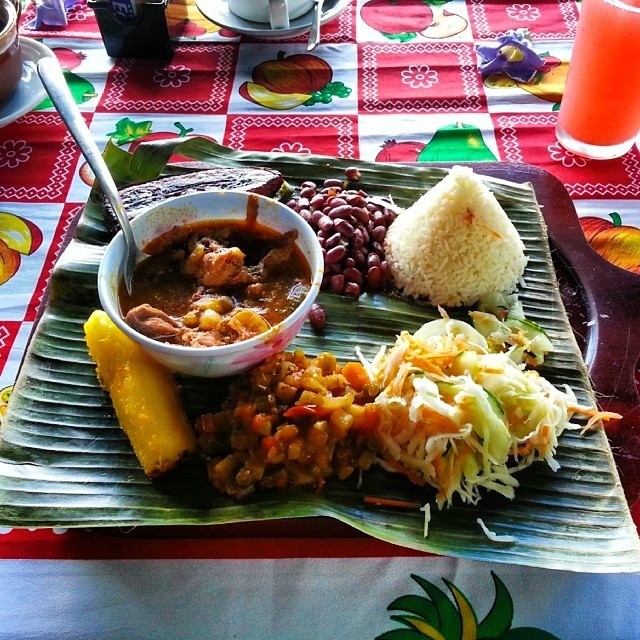 We also tried Costa Rican tamales and as much picadillo and hot salsa we could ask for. 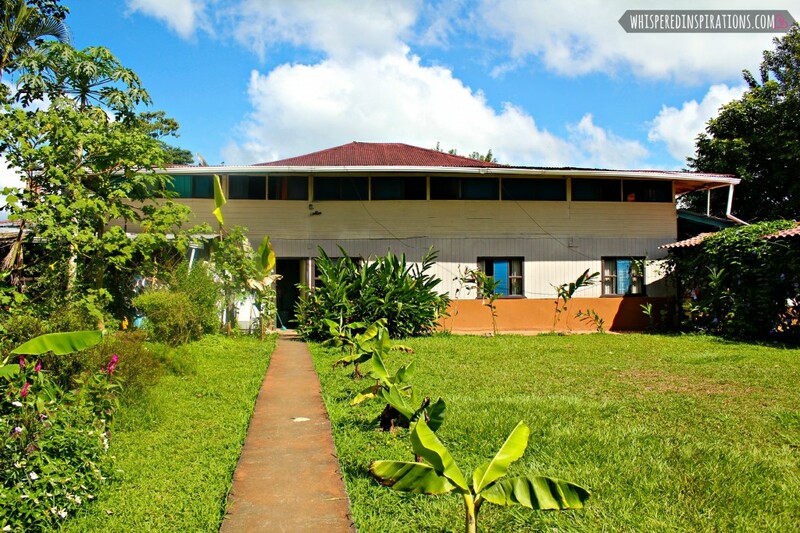 The house also doubles as a bed and breakfast, it is pretty large and can accommodate up to 32 people. The main dining room is absolutely beautiful. 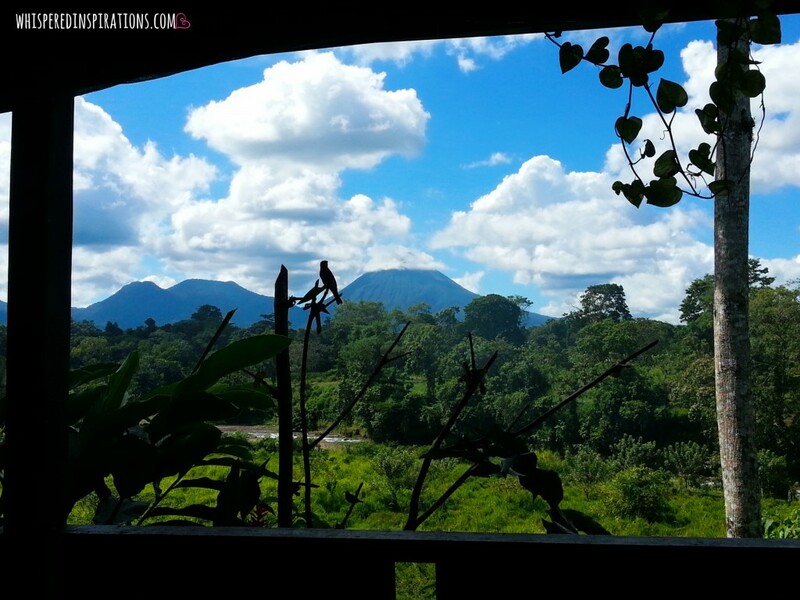 Panoramic views of the Volcan Arenal and breathtaking views of the winding Rio de La Fortuna. It was very memorable. We had a few lunch guests as the tropical and brightly colored birds decided to join us and perched on nearby branches. All in all, it was a great experience to be submersed into Costa Rican culture and both Eli and Milton are doing a great job preserving their rich heritage. You can visit CulTours for more information and to book a tour if you are in the La Fortuna area. 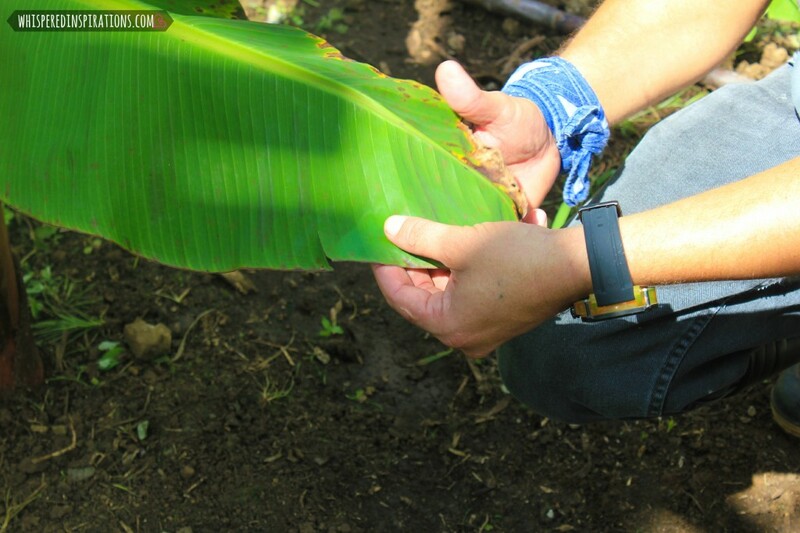 Next, I’ll share with you another excursion we challenged ourselves with while in the La Fortuna area. Stay tuned. 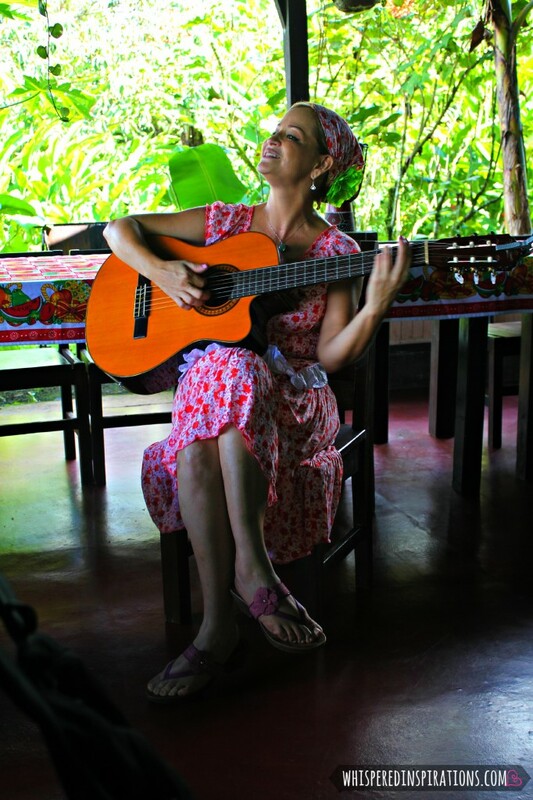 For a taste of Costa Rican rural life, visit La Casona de Rio Fortuna. When you do a tour abroad, do you like to take in their culture? Let me know til then, cheers m’deres! I love taking in the culture when I travel! 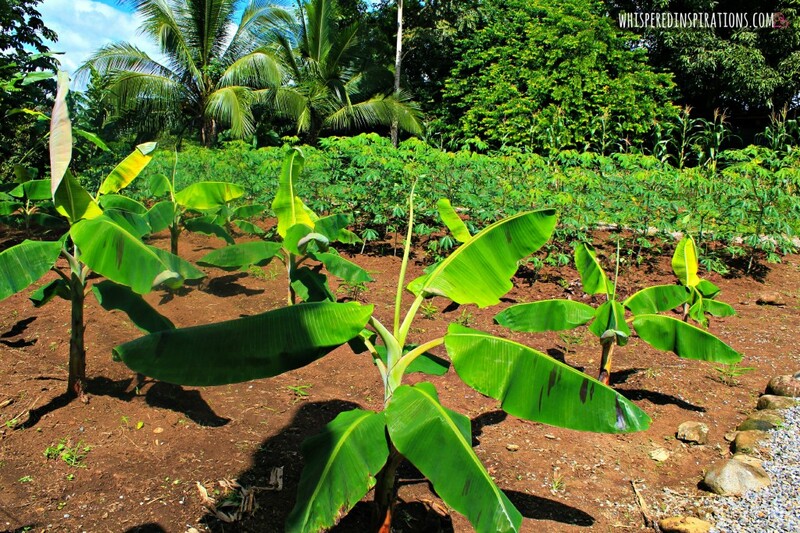 When I went to Costa Rica, I stayed with a local family, and it was an amazing experience. I can't wait to hear about what you tried — ziplining? I love experiencing local culture when abroad. It sounds like you are having some wonderful experiences! I\’ve learned so much and went back to my childhood in some of my experiences. It was beautiful. 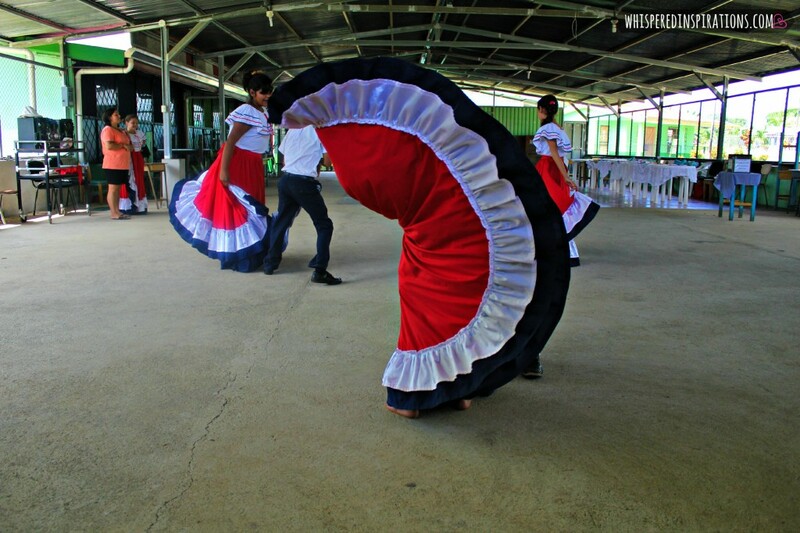 My daughter's former school travels to Costa Rica each year for a cultural exchange. My daughter wasn't able to go but we thought it made a fantastic learning experience. Your pictures are beautiful and makes me want to make Costa Rica a travel destination in the future. Thank-you so much. WOW, what a great opportunity that would have been. Oh the food!! It looks and sounds absolutely amazing. And your photos are gorgeoius. Thank-you! Oh, that was one of the best parts. So yummy! We try. We travel with our kids and we often do that within safe boundaries of a tour or a group excursion. We are super conscious of not venturing too far away and getting into any worrisome situations. Your pictures are amazing Nancy! Awesome trip. We are very much still interested in making a similar trip some time soon. I want to travel the entire world too. So many places to see! Thank-you so much! 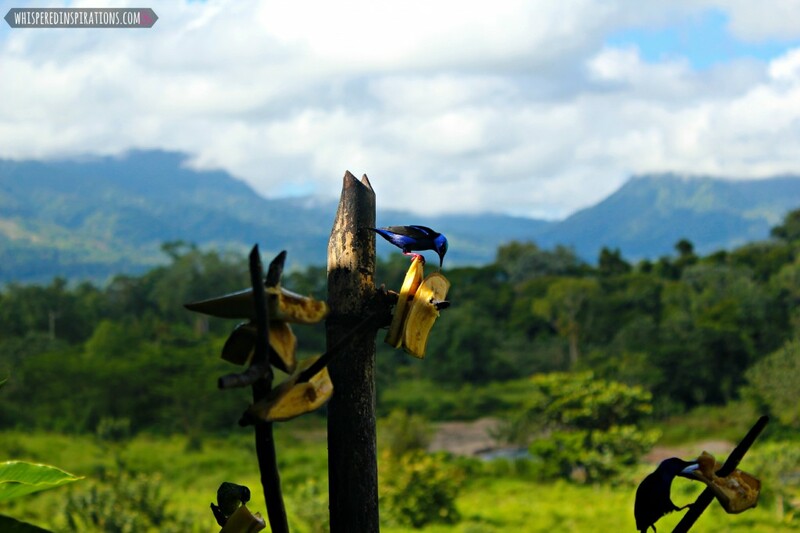 I was so inspired and taken aback by the beauty of Costa Rica. 🙂 I am more than happy to share its beauty! Thanks for following along. Looks amazing. The culture, the land and the food looks wonderful! So many great places to see!!! I love it! Costa Rica sounds like a beautiful place. I'd love to try their coffee! Coffee is delish! They sell a blend in some Starbucks locations. What an amazing experience!! Such beautiful culture. You're so lucky to be able to travel like this. Wonderful! I want to see the world! Don\’t we all? Hehe. It was an amazing culture and experience though. I am humbled. Your pictures are stunning! What a remarkable experience. My husband is Mexican so we have lots of delicious latin food at our house, but I would love to try food from Costa Rica – your meal looked amazing! The food was amazing everywhere we went. 🙂 It was really nostalgic. 😀 And I love their typical breakfasts, it\’s what I grew up on. wow sounds like you had a great time. hubby found a recipe online and made homemade tortillas a few times. they are much better than the ones you buy in store but they don't really keep so you have to eat them right away and aren't good for leftovers. Definitely, we make home made and they don\’t last long. I guess it is because there are not any preservatives. Hehe.